As a former first grade teacher, I LOVE creating activities for preschoolers for my young twins. I’m always on the look out for activities to promote their development that also incorporate lots of fun! The teacher in me thoroughly enjoys spending oodles of time creating lessons and challenging activities for my preschoolers. But nothing can deflate me faster than all of my hard work being a bust. Let’s face it….sometimes, we need these rambunctious kids to stay busy with the activity for longer than 3 minutes!!! SHORT ON TIME? 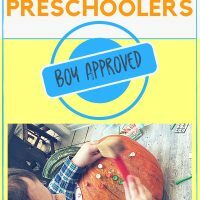 PIN NOW & READ ABOUT ACTIVITIES FOR PRESCHOOLERS LATER! Does your son spend 62 seconds with the activity and then is ready for the next? If you’re a boy-mama, I bet you feel me! My friends with little girls always tell me how their sweet precious daughters will sit and color for an hour!!! Meanwhile, my rowdy twin boys have connected the markers end to end and are busy having a sword fight!! Quick Activities for Preschoolers that Aren’t Over Quickly! I love preparing activities for kids at home. It’s the perfect way to still get my teacher-fix since I’m now a stay at home mom. But there’s nothing more disappointing than to go to all of that work to have the boys completely uninterested. And with our crazy busy life, I need activities I can pull together quickly! When I find an activity that keeps the attention of these wild twin boys of mine, I get super excited! I am not exaggerating when I say that my boys spent hours over the next several days with this pumpkin activity!! Talk about getting bang for my buck! And this gives you time to get all kinds of things done—such as your fall decorating! By the way, this is by no means my own original idea. One of the twins, Beckem, has an extremely rare disorder called KAT6A. He has physical therapy, occupational therapy, and speech therapy twice a week. Recently, at the therapy center, they had a pumpkin and golf tees for the kids to hammer! I went straight to the store and bought 2 largish pumpkins and a package of colorful golf tees. Why two pumpkins? Can’t they just share one pumpkin? Um….yeah…if I want one kid to be hammered in the head! If you have twins or deal with sibling rivalry, just splurge on a second pumpkin….totally worth the extra four bucks! Do I give my kids a real hammer? If you will be right next to your child for the ENTIRE activity, then I suppose a real hammer is do-able. But, my goal was to have the twins busy for longer than 62 seconds WITHOUT needing me right beside them. We use our little wooden hammers that came with various toys that we already own. One hammer came with our pound-a-peg toy and one hammer was with this hammer ball toy. These little lobster mallets would work as well or you could also use a wooden block. I set up in the dining room so I could work in the kitchen and still easily oversee the activity. I pour the golf tees into two separate plastic bowls and place next to each pumpkin. Kids get so excited with pumpkins!! Especially their very own! Get this Pumpkin Party Started! You can begin by sharing a fun fall book like Too Many Pumpkins or Pumpkin Jack. Then if the pumpkins are dirty, you can do a little pumpkin scrubbing! My boys love water and dirt, so combine the two and they are in heaven! Before I let the boys touch a hammer (even a kid hammer), I go over all of the expectations of the activity. Now, let me ask….are we going to use the hammer to pound the table? Are we going to hammer the cat? Are we going to hammer our brother? All of their responses should be NO! Are we going to ONLY use the hammer to pound the pegs into the pumpkin? Okay, I know I can trust you boys to do the right thing and have self control, but should you decide to hammer anything other than a peg into a pumpkin, you will lose your hammer privilege. No second chances, everybody understand?? After I have established my zero tolerance for possible emergency room visits, I model and explain how to hammer the golf tees. First you place the pointy end of the peg on the pumpkin with your helper hand (that’s the left hand for both my boys) and hold it steady. Next, you tap the end of the peg until it is all the way into the pumpkin!! Younger children and toddlers will likely need you to show them ‘hand over hand’ the first few times. In fact, you will probably need to go ahead and push the golf tee in just a smidgen to get them started. The twins are 5 years old, and Adler was able to independently do this, but Beckem didn’t have the strength to make that first puncture into the pumpkin. I also had to help Beckem with hammering ‘hand over hand’ the first several times so he could get the feel of it. So that I didn’t have to stop every few minutes and get a peg started for Beckem, I went and stuck a bunch of the golf tees into his pumpkin so that all he had to do was hammer each one. This simple activity for kids provides so many benefits! Your child needs all of these skills for eventual independent daily living and this is such a fun way to work on that! RELATED: How to Manage Your Time as a Busy Mom—and be sure to download the Simple Schedule Workbook below to get your Mom-schedule organized! 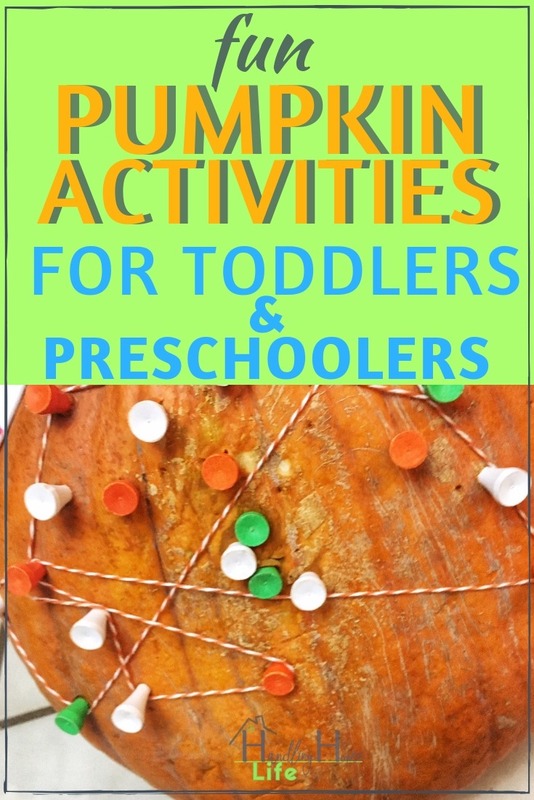 These are perfect indoor activities for toddlers or preschoolers! Even older children love hammering stuff! So let’s keep learning! After the boys hammered a bunch of the golf tees into the pumpkin, I tied a piece of string around one golf tee. They thought it was fun to wrap the string around the tees and create different shapes. You can use stickers to decorate your pumpkin! The twins were entertained for quite some time by putting mustaches, eyes, and other silly stickers on their pumpkins. Stickers are another great fine motor activity! You can use your parts from Mr. or Mrs. Potato Head to create a Mr. Pumpkin Head!! What if I don’t Have a Pumpkin? What if it’s the wrong time of year to find a pumpkin or maybe you just don’t want to leave the house? What else can I milk out of this? You can place colored stickers on your hammering object and tell your child to hammer all of the blue stickers and then all of the yellow and so on. Or if you have the colored golf tees, he can hammer the matching golf tee into the same colored sticker. If you don’t have the colored tees, just color the end of yours with a marker. 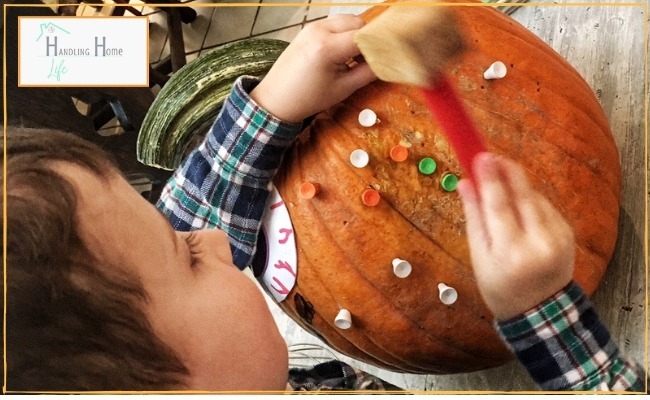 You can draw shapes on the pumpkin, styrofoam, box, or whatever you are using, and have kids hammer the shape. You can draw large dots in the shape of a square (or whatever shape you like) and as the child hammers a golf tee into each dot, he creates the shape! Write letters or put alphabet stickers on your pumpkin and have the child hammer all of the letters, only the vowels, lower case letters, etc. Another variation is to write the letters on the end of the golf tees and have your child match them to the letters on the pumpkin. You can easily target whatever skill your child is working on at the time. You can do all of the above activities using numbers! 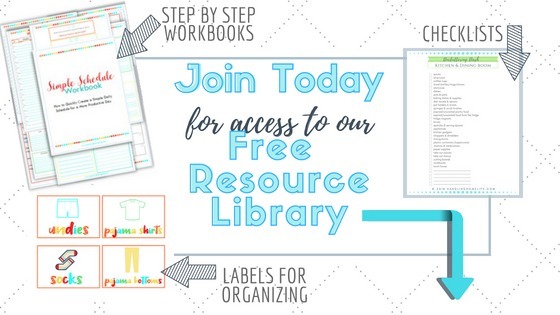 There are endless ways to differentiate activities for preschoolers! Such a great way for kids to learn while having FUN! 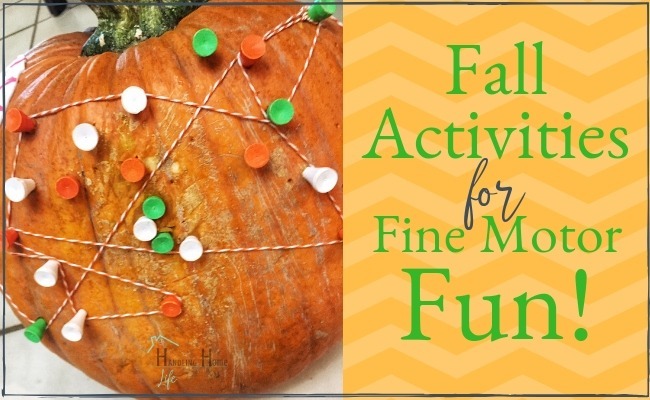 What are your favorite activities for fine motor skills? If you liked this post, I’d be so very grateful if you could save it to Pinterest so others can benefit! Your support means so much to me! While you’re at it, I’d love if you follow me on Pinterest for more ideas like this! All content here should be considered as opinion only. Always seek the advice of your own health professional for any questions or concerns you may have regarding your health or the health of others See full disclaimer. These activities look like fun! I’m sure my boys would have a blast with them. Thank you, Emily! I know my boys love anything that involves hammering!